More recent research has shown us that the PCL also prevents medial-lateral (side-to-side) and rotatory movements. This confirms the suspicion that the PCLâs effect on knee joint function is more complex than previously thought. The symptoms following a tear of the PCL can vary. 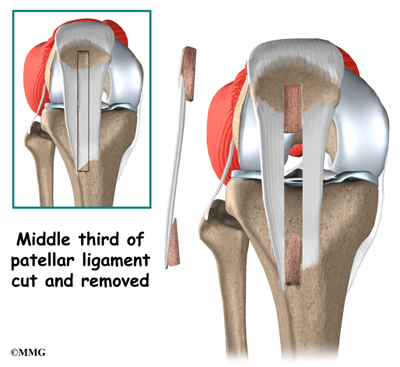 The PCL is not actually enclosed inside the knee joint like the ACL. So unlike an ACL tear, which swells the joint with blood, PCL injuries don't make the knee swell as much. 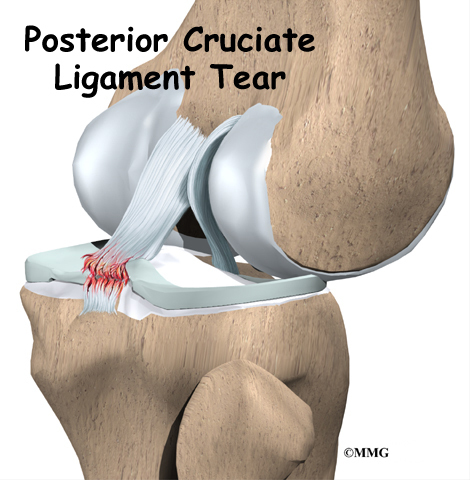 Most patients with a PCL injury sense a feeling of stiffness and some swelling. Some patients may also have a feeling of insecurity and giving way of the knee, especially when trying to change direction on the knee. The knee may feel like it wants to slip. In some cases, arthroscopy may be used to make the definitive diagnosis if there is a question about what is causing your knee problem. Arthroscopy is a type of operation where a small fiber-optic TV camera is placed into the knee joint, allowing the surgeon to look at the structures inside the joint directly. The vast majority of PCL tears are diagnosed without resorting to this type of surgery, though arthroscopy is sometimes used to repair a torn PCL. Less severe PCL tears are usually treated with a progressive rehabilitation program. Patients intending to return to high-demand activities may require a functional knee brace before returning to these activities. These braces are designed to replace knee stability when the PCL doesn't function properly. They help keep the knee from giving way during moderate activity, but they can give a false sense of security and won't always protect the knee during sports that require heavy cutting, jumping, or pivoting. These braces are not the type you can buy at the drugstore. Most orthopedists will recommend wearing a brace for at least one year after a reconstruction, so even if you decide to have surgery, a brace is probably a good investment. Even when surgery is needed, most surgeons will have their patients attend physical therapy for several visits before the surgery. This is done to reduce swelling and to make sure you can straighten your knee completely. This practice reduces the chances of scarring inside the joint and can speed your recovery after surgery. Most surgeons now favor reconstruction of the PCL using a piece of tendon or ligament to replace the torn PCL. This surgery is most often done using the arthroscope (mentioned earlier). Incisions are usually still required around the knee, but the surgery doesn't require the surgeon to open the joint. 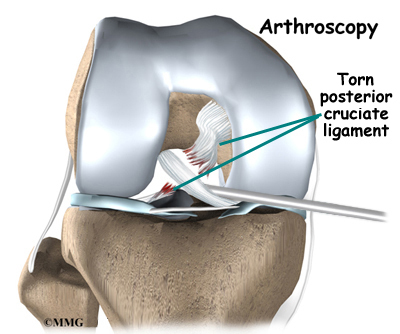 The arthroscope is used to perform the work needed on the inside of the knee joint. Most PCL surgeries are now done on an outpatient basis, and most patients stay either one night in the hospital, or they go home the same day as the surgery. Another very common graft involves using two of the three or four strips, the graft has nearly the same strength as a patellar tendon graft. The gracilis and semitendinosus tendons can be taken out without really affecting the strength of the leg because bigger and stronger hamstring muscles will take over the function of the two tendons that are removed. Other materials are also used to replace the torn PCL. In some cases, an allograft is used. An allograft is tissue that comes from someone else. This tissue is harvested from tissue and organ donors at the time of death and sent to a tissue bank. The tissue is checked for any type of infection, sterilized, and stored in a freezer. When needed, the tissue is ordered by the surgeon and used to replace the torn PCL. The advantage of using an allograft is that the surgeon does not have to disturb or remove any of the normal tissue from your knee to use as a graft. For this reason the operation also usually takes less time. You may use a continuous passive motion (CPM) machine immediately after your operation to help the knee begin to move and to alleviate joint stiffness. The machine straps to the leg and continuously bends and straightens the joint. This continuous motion is thought to reduce stiffness, ease pain, and keep extra scar tissue from forming inside the joint. Your surgeon may also have you wear a protective knee brace for up to six weeks after surgery. You'll probably use crutches for two to four weeks in order to keep your knee safe and will probably be instructed to put only a limited amount of weight down while you're up and walking. Strengthening exercises for the quadriceps muscle on the front of the thigh are safe to begin right away. Muscle stimulation and biofeedback, which both involve placing electrodes over the quadriceps muscle, may be needed at first to get the muscle going again and help retrain it. As the rehabilitation program evolves, more challenging exercises are chosen to safely advance the knee's strength and function. When you get full knee movement, your knee isn't swelling, and your strength is improving, you'll be able to gradually get back to your work and sport activities. Some surgeons prescribe the use of a functional brace for athletes who intend to return quickly to their sport. Ideally, you'll be able to resume your previous lifestyle activities. However, athletes are usually advised to wait at least six months before returning to their sport. And most patients are encouraged to modify their activity choices.